Craft an easy yet unforgettable Tiramisu Cheesecake! 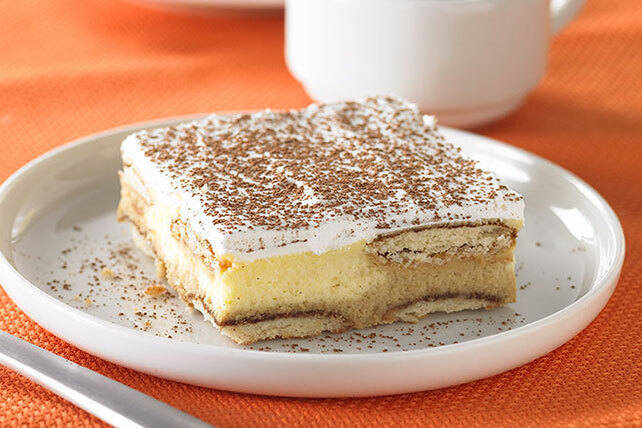 Our version of Tiramisu Cheesecake features tiramisu-inspired flavors layered with creamy cheesecake. Line 13x9-inch pan with Reynolds Wrap® Aluminum Foil, with ends of foil extending over sides. Spread half the wafers onto bottom of prepared pan. Add 2 tsp. coffee granules to 2 Tbsp. hot water; stir until dissolved. Brush half onto wafers in pan; reserve remaining dissolved coffee for later use. Beat cream cheese and sugar in large bowl with mixer until well blended. Add sour cream; mix well. Add eggs, 1 at a time, mixing on low speed after each just until blended. Remove 3-1/2 cups batter; place in medium bowl. Dissolve remaining coffee granules in remaining hot water. Stir into removed batter; spread over wafers in pan. Top with remaining wafers; brush with remaining dissolved coffee. Cover with remaining plain batter. Bake 45 min. or until center is almost set. Cool. Refrigerate 3 hours. Use foil handles to lift cheesecake from pan. Spread with COOL WHIP just before serving; sprinkle with cocoa powder. Heat oven to 325°F if using a silver 9-inch springform pan (or to 300°F if using a dark nonstick 9-inch springform pan). Assemble cheesecake as directed. Bake 1 hour or until center is almost set. Run knife or metal spatula around rim of pan to loosen cake; cool before removing rim. Refrigerate 4 hours. Continue as directed. Prepare with PHILADELPHIA Neufchatel Cheese, BREAKSTONE'S Reduced Fat or KNUDSEN Light Sour Cream and COOL WHIP LITE Whipped Topping.